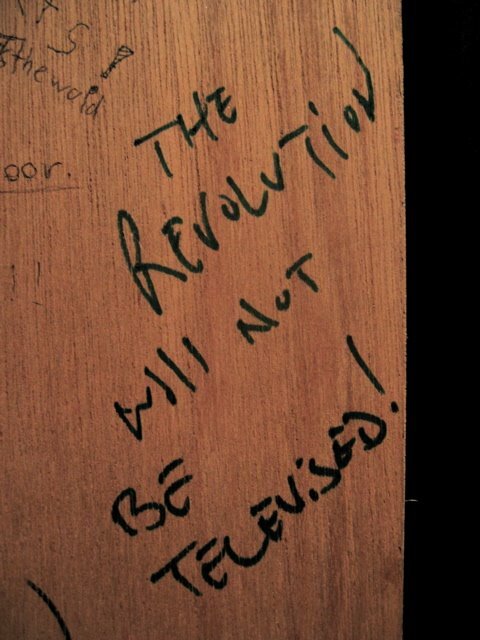 Graffiti found in the bathroom at the Living Room music venue in Manhattan warns us, "The Revolution WIll Not Be Televised!" ... And our L's will not be capitalized! Actually I'm not sure if this is a result of a misused uppercase i, or two lowercase L's. Either way, I'm revolted. you don't deserve this one. the "i" in "will" is clearly a slurred lowercase- look at that double-stroke. they tried to dot that vowel. they tried their hardest. so what if they failed. we all fail sometimes. failures can be beautiful in their humanity. since the "i" is lowercase, it's okay for the L's to be lowercase too. (look, they even used a lowercase i in "televised", which is incontrovertible proof). 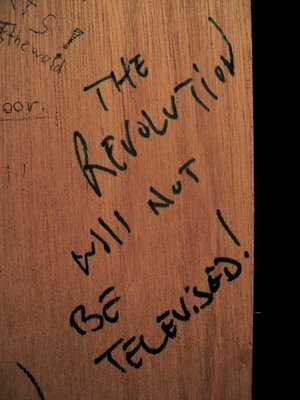 The revolution will not be televised, is a documentary, a very good one at that. 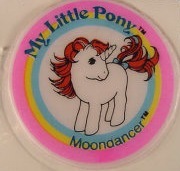 It was actually made by a distant relative of mine.